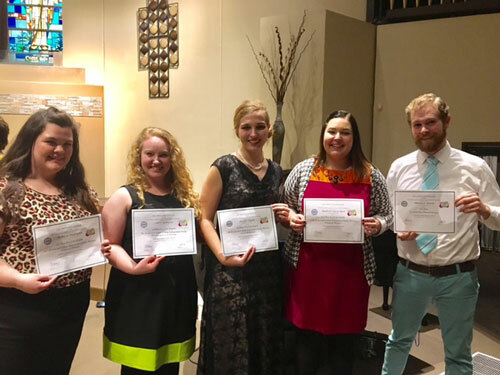 Students in Southern Utah University’s Department of Music recently returned from the Cal-Western Regional National Association of Teachers of Singing Competition in Phoenix, Arizona. Many of the students from SUU who participated received awards in the competition. The region encompasses Utah, Nevada, Arizona, California and Hawaii colleges and universities as well as independent teachers in those states with over 340 singers competing. Students who received first place in their divisions were, Ian Allred, Lower College Musical Theater Men; Eliza Carpenter, Lower College Musical Theater Women; Claire Robinson, 19-Year-Old Lower College Women. Second place awards went to Emily Dimond, 19-Year-Old Lower College Women; Madi Davis Ilgen, 21-Year-Old College Women; Matthew Henry, Adult Men; Rebecca Dayley Parkinson, 22-Year-Old College Women. With third place awards for Tamsyn Scott, 18-Year-Old College Women, and Jocelyn Taylor, 21-Year-Old College Women with an Honorable Mention for Jordan Sanders in Advanced College Men. All of the students who placed will go on to the next round which is held on YouTube and encompasses the entire United States. If students place in that competition, they will qualify for the National Competition this summer held in Boulder, Colorado. For more information about the Department of Music at Southern Utah University, please visit www.suu.edu/music.